The Gales is now showcasing its latest luxury show home in Ladysmith, by award-winning GNB Builders. This 3,000 sq. ft. Built Green® custom patio home offers the best in modern environmentally-friendly materials and construction techniques, offering a luxury home in a stunning location. The kitchen features custom floor to ceiling cabinetry, granite countertops, and island with built in sink and eating bar. The main-floor master bedroom is complete with a luxurious ensuite and walk- in closet with custom cabinetry. The wrap-around oceanview decks are extensive and will easily accommodate enough outdoor furniture to keep your guests comfortable on summer evenings. Situated overlooking the Georgia Strait on the east coast of Vancouver Island, The Gales villas and bungalows offer residents sweeping ocean and mountain views. Life at The Gales gives you the opportunity to enjoy outdoor pursuits year-round - from a walk on one of the many local beaches to leisurely strolls through pristine forest right at your back door. The town of Ladysmith provides everything you need to enjoy living in a small community. And the Nanaimo airport is only 10 minutes away, offering daily flights to Vancouver and Calgary. Easter Sunday is a busy day at Crown Isle Resort in Courtenay, with activities for all ages. 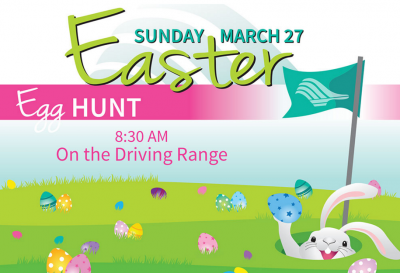 Start the day with an Easter egg hunt on the driving range. The search begins at 8:30 am. Afterwards, enjoy a pancake breakfast in the ballroom. Entry is by donation – funds benefit Crown Isle’s Community First programs and help support future programs like the Holiday Resort Walk. Suggested donation is $5/family. In the afternoon, bring the family for Easter Sunday Brunch in the Ballroom. Featuring a delectable spread from Chef Chris Turner and the Crown Isle culinary team. Brunch is $39 per person plus taxes and gratuity. The day wraps up with a traditional Easter dinner at 5 pm. Dinner is $49 per person, plus taxes and gratuity. Both brunch and dinner will feature musical accompaniment by SoundBite - cellist Jordie Robinson and guitarist/vocalist Franco Noviello. Please call 250-703-5000 for reservations for any of the events or for more information. 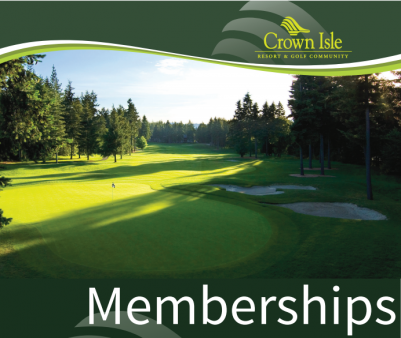 Now is the time to pick up your 2016 Crown Isle Golf membership. The stunning championship course in the Comox Valley offers a number of different membership options designed for all level of player. 2016 brings with it many new additions to membership benefits! Choose from full memberships that allow for unlimited golf 7 days a week year-round, with 21-day advance booking privileges, to social memberships which offer deep discounts on prime time golf and the benefit of advance booking. Corporate memberships are a great way to entertain clients, offer staff incentives or enjoy some team bonding and save. This year, Crown Isle memberships include reciprocal play agreements with Westin Bear Mountain and Quilchena Golf Courses, discounts on fitness memberships, golf lessons and in the Pro Shop. The benefits go far beyond the golf course. Are your kids golfing now too? All dependents – 18 and under – are now included in your annual full and limited memberships, or purchase a Fairway Kids membership and they’ll enjoy unlimited golf all season. All memberships are valid through March 31, 2017. Contact the Pro Shop today for more information, or download the membership information and application from the Crown Isle website. Welcome to The Ridge, a new residential Courtenay community featuring mountain and ocean view lots. Many new home owners at The Ridge already know that this new community is one of the prime locations in the Comox Valley, as they have already purchased or built their new home in this premium location. You have a variety of choices when building your new home at The Ridge: a rancher/bungalow style home, a two-level home, a home with a secondary suite or a residential lot with enough room for a home and a carriage home! Stop in to see the show homes by their main builders: Brando Homes and Lawmar Contracting. Imagine looking east towards the Strait of Georgia, the Coastal Mountain Range and the Comox Marina and watching the sunrise from your new home, or sitting on your deck or patio and watching the sun set over the Comox Glacier and the Beaufort Mountains. The views, the lifestyle, the enjoyment are all right here in Courtenay. And you're just minutes away from restaurants, malls, shopping and the downtown area. Note: This subdivision is fairly new, and Google does not even have our address on their map yet! With ocean views, luxury finishes and a commitment to the environment, homeowners at The Gales are living the ultimate Vancouver Island lifestyle. 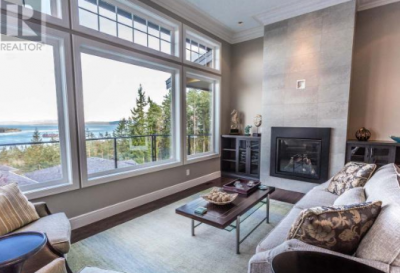 Now is your chance to own your own luxury ocean view villa on central Vancouver Island. The Gales in Ladysmith is now showcasing its latest luxury show home by award-winning GNB Builders. This 3,000 sq. ft. Built Green® custom patio home offers the best in modern environmentally-friendly materials and construction techniques, offering a spectacular home in a spectacular location. Situated overlooking the Georgia Strait on the east coast of Vancouver Island, The Gales patio homes and bungalows offer residents sweeping ocean and mountain views. Life at The Gales gives you the opportunity to enjoy outdoor pursuits year-round - from a walk on one of the many local beaches to leisurely strolls through pristine forest right at your back door. The town of Ladysmith provides everything you need to enjoy living in a small community. And the Nanaimo airport is only 10 minutes away, offering daily flights to Vancouver and Calgary. Baby boomers and retirees are cashing in on high real estate prices in Vancouver and the Lower Mainland and are looking to relocate where they can enjoy an affordable lifestyle in comfort. They are also seeking a place to recreate and enjoy a temperate climate where they can golf, hike, ski, enjoy water sports, fish and live in a vibrant community. The Ridge in the Comox Valley offers all of this with new homes starting at $430,000. In a report released by Sotheby’s International Realty Canada on March 3, 2016, real estate prices on single family homes is expected to continue to rise in the Vancouver and Toronto markets. The first two months of 2016 saw prices of homes increase by 23 percent over 2015 in Vancouver. The report goes on to say, “Toronto and Vancouver will continue to lead luxury home sales in Canada this spring in both volume and price, and mostly for the same reasons they dominated last year” which cites macro-economic trends including limited inventory and strong demand from buyers. The Ridge Offers New Homes starting at $430,000! 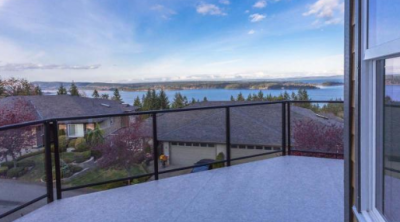 Imagine looking out at the Comox Marina and toward the east, watching the sun rise from your new home, or sitting on you back deck, watching the sun set over the Comox Glacier. Many new home owners are enjoying their new homes at The Ridge. Come by and see the show homes by Brando Homes and Lawmar Contracting. 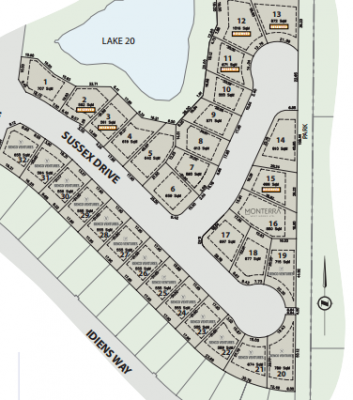 Crown Isle is pleased to announce their latest 32 lot subdivision in the Crown Isle Community in Courtenay on Vancouver Island. The Sussex Extension / Lake 20 subdivision is located at the end of Sussex Drive, behind the existing homes on Idiens Way in the Community's south end. This double cul-de-sac design will provide a safe, quiet environment for your next home, with no through-traffic. Following the lot registration, 7-10 new custom homes are already planned to begin construction. 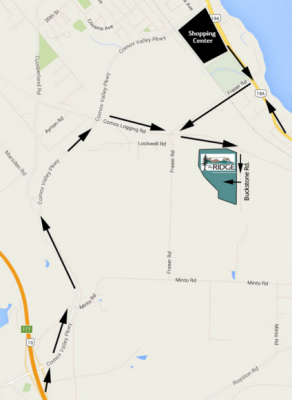 Benco Ventures, Crown Isle's largest builder, has reserved another 10 lots in this subdivision and has variety of home plans for different budgets available. There are still some beautiful lots backing on to the lake to choose from for your new dream home.